Refresh outdoor seating areas with these dual pedestal rectangular picnic tables. With 6', 8' and Universal Access models, these popular tables utilizes 11-gauge 4" square steel tubing for the frame and support arms. 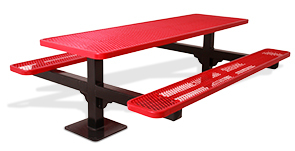 These all-steel, extra heavy-duty rectangular picnic tables feature top-of-the-line, weather and vandal resistant finishes. Tables are available in a popular selection of color options, polyethylene tops and seats—the frames are finished with a powder-coating.